Disaster is nothing new to the people of Guilford, Maine. Over the course of the town’s 213-year history, all manner of fire and flood have battered this small community on the banks of the Piscataquis River. Mention the Great Flood around here, and you’re likely to draw a quizzical look or two. Do you mean the flood of 1929? 1936? 1954, maybe? Or are you talking about April Fools’ Day 1987? That was when the river crested at levels seven feet higher than ever, pushing through huge ice floes that damaged more than 50 homes and destroyed many other structures. According to the Guilford Historical Society, the town sustained damages of more than $1 million. A Great Fire reference has plenty of candidates too, including those that destroyed the old high school (1925), the Town Hall (1928), and parts of downtown (1983). Yet time and again, the people of Guilford picked themselves up, brushed each other off, and carried on. Never has their grit been on display quite like it was between June 1958 and June 1960. The fire started at about 12:15 pm, according to the report, near a dryer machine “at the lathing end of the 350-foot plant, where veneer work had been in progress.” The dryer was not in operation at the time of the fire, Hardwood Products co-founder Joe Cartwright said. Recognizing the plight of a respected business and a major employer in the region, fire departments from four surrounding towns answered the call for help. In the end, all but three warehouses of the 10-building plant, including machinery and stock, were destroyed. Thankfully, only a few firefighters were injured. Only three warehouses of the 10-building Hardwood Products plant remained standing after the devastating fire in late June 1958. The community rallied and by June 1960, the plant was back to full operation. 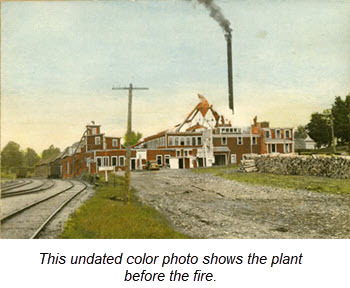 Through it all, Hardwood recognized how hard people were working to save the plant. You might say it was largely out of gratitude that ownership made its next move. Plans to rebuild were in the works virtually before the ruins had cooled. The company wanted to ensure plant workers that they had a livelihood for their families until the plant was again operational. In the fall of 1958, plant employees – still on the company payroll, despite the disaster – got back to work, not only to rebuild the plant, but to manufacture and install new production equipment, as well. By August 1959, limited production was back online, and by June 1960, it was back to a full schedule. Because of Harwood’s reputation for quality and service, the customer base quickly returned. Revitalized, the company grew and by the mid-1960s, leadership opted to focus more on the production of medical and health products. Decisions made in those days placed Puritan on the trajectory the company enjoys today. You can find details about that rise on both our company timeline and our 100 Years of Excellence page. These days, the bond between the company and community are stronger than ever. Employees who serve with the Guilford Fire Department are free to respond to calls during their workdays without losing pay. And the company makes a significant financial contribution to the fire department every year. 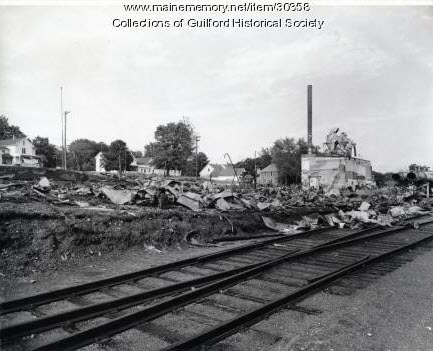 Local history buffs can argue which disaster was the most catastrophic to the people of Guilford. But their greatest moment? There’s little doubt that played out over 24 months between June 1958 and 1960. And we’re still feeling its impact today.